Milton Friedman was all about freedom until the day he died. Abstract: July 31, 2012, is the one hundredth anniversary of the birth of the great economist and thinker Milton Friedman. It was Friedman who first suggested that the economic freedom of countries be measured and monitored, and The Heritage Foundation has been doing so since 1995 in its Index of Economic Freedom. Friedman’s most important legacy is unquestionably the improvement in living standards of hundreds of millions of people around the world thanks to the implementation of his theories. Unfortunately, the policies of an increasingly leviathan government have placed America on a path that diverges sharply from its historical quest for greater freedom. At Milton Friedman’s centennial, Americans should renew their commitment to economic freedom, as well as their confidence that a people who are free to choose will ensure their own future well-being. July 31, 2012, is the one hundredth anniversary of Milton Friedman’s birth. Friedman, “the most influential economist of the second half of the 20th century, possibly all of it,” was the champion of the powerful idea that free markets and individual choice lead society to ultimate prosperity and overall well-being. His contributions to economic theory, and the conviction with which he espoused them, made him truly an extraordinary giant among political and economic thinkers. Over the last 30 years, Friedman enjoyed a close relationship with The Heritage Foundation. He was the featured speaker at the 1979 dedication of our headquarters building, our 1983 10th anniversary “Heritage 10” celebration, and other occasions. In 1998, I awarded Rose and Milton Friedman The Heritage Foundation’s Clare Boothe Luce Award, our most distinguished honor. Friedman and Heritage have been closely linked in the policy arena for a very long time. Indeed, many of Friedman’s perspectives and policy ideas are not only far-reaching, but truly enduring throughout generations via his own publications, as well as through others’ countless scholarly researches, whose underlying theses trace back to Friedman’s insights. The Heritage Foundation’s numerous innovative research publications are no exception. Friedman’s economic, philosophical, and political writing has inspired decades of Heritage work in such diverse areas as welfare reform, competition in education, budget reform, and free trade. People across the globe are particularly indebted to Milton Friedman for his role in championing economic freedom, and that effort lives on in The Heritage Foundation’s annual Index of Economic Freedom. Friedman elaborated “the role of competitive capitalism—the organization of the bulk of economic activity through private enterprise operating in a free market—as a system of economic freedom.” Indeed, it was Friedman who first suggested that economic freedom of countries around the world be measured and monitored. To many who have long tracked economic freedom, the years since 2008 have served as a vivid reminder of the continuing struggle between the state and the free market. In times of uncertainty, it may be natural that people will look to their governments for answers. Yet the long-term solutions to our current economic problems do not lie in more government controls and regulations. They lie in a return to free-market principles. Perhaps the most critical lesson of the past four years of ever-growing government intrusion into America’s free-market system is that the fundamental superiority and value of economic liberty must be steadfastly reiterated, or even re-taught, to many political leaders and policymakers. The Index offers plenty of evidence of the lasting values of freedom that Milton Friedman so keenly articulated and advocated. In the only cases in which the masses have escaped from the kind of grinding poverty you’re talking about…they have had capitalism and largely free trade…. So that the record of history is absolutely crystal clear: that there is no alternative way so far discovered of improving the lot of the ordinary people that can hold a candle to the productive activities that are unleashed by a free enterprise system. As the Index has repeatedly illustrated over the past 18 years, the relationship between economic freedom and prosperity is strongly positive. Gross domestic product (GDP) per capita is much higher in countries with greater economic freedom. On average, economies rated “free” or “mostly free” enjoy incomes that are more than double the average levels in all other countries, and more than seven times higher than the incomes of “repressed” economies (see Chart 1). More important, a sustained commitment to economic freedom is critical to ensuring economic growth and prosperity. Not only is a higher level of economic freedom clearly associated with a higher level of per capita income, but countries’ improvements in economic freedom also increase their income growth rates, ensuring economic and social progress (see Chart 2). Also notably, as Friedman suggested, true economic freedom requires free markets at home and free trade around the world. Trade drives prosperity, providing greater economic opportunity in countries that choose to embrace free-trade policies. On average, economies with the most trade freedom have the highest per capita GDP (see Chart 3). It is economic freedom that effectively improves overall well-being for a greater number of people. The Index has documented various tangible non-materialistic benefits of living in freer societies administrated by limited government. As Friedman witnessed again and again, not only are higher levels of economic freedom associated with higher material prosperity, greater economic freedom also strongly correlates with overall well-being, which takes into account such factors as health, education, and personal safety (see Chart 4). The Index has empirically explored this critical relationship between economic freedom and political freedom or democratic governance. As illustrated in Chart 5, there is a strongly positive correlation between the two, and little doubt that higher levels in either generally have a positive impact on the other. As the Index has demonstrated, economic freedom is highly correlated with entrepreneurial activity in the private sector, creating new jobs and increasing opportunities and choices for individuals in advancing their own well-being (see Chart 6). When individuals are allowed to decide themselves how best to pursue their dreams and aspirations, their collective achievements driven by individual choices, not by government mandates, add up to a better society for all. To put it differently, economic freedom is positively linked to innovation that is often nurtured by free enterprise, not by central planning (see Chart 7). The proven path to revitalizing economic growth is to advance economic freedom by promoting policies that generate a virtuous cycle of innovation, job creation, and productivity growth that, in turn, helps to advance social and economic evolution. Fortunately, we are waking up. We are again recognizing the dangers of an over-governed society, coming to understand that good objectives can be perverted by bad means, that reliance on the freedom of people to control their own lives in accordance with their own values is the surest way to achieve the full potential of a great society. Fortunately, also, we are as a people still free to choose which way we should go—whether to continue along the road we have been following to ever bigger government, or to call a halt and change direction. Though stated three decades ago, the Friedmans’ keen observations are shockingly relevant to today’s challenging time for America. The reckless and populist policy choices of an increasingly leviathan government have placed the United States on a path that diverges sharply from its historical quest for greater freedom. Worse, the system of competitive capitalism that is responsible for America’s unprecedented prosperity is being replaced by a crony capitalism that encourages the concentration of power that Friedman warned was one of the greatest threats to freedom. Still, there are signs that, as in Friedman’s day, the American public is waking up, and maybe—just maybe—one can be optimistic that freedom will again prevail in America. So, at Milton Friedman’s centennial birthday, Americans should renew this country’s commitment to economic freedom, as well as their confidence that a people who are free to choose will make the right decisions to ensure their future prosperity and happiness. —Anthony B. Kim is a Senior Policy Analyst in the Center for International Trade and Economics (CITE), and Ambassador Terry Miller is Director of CITE, and the Mark A. Kolokotrones Fellow in Economic Freedom, at The Heritage Foundation. – Milton and Rose Friedman, Two Lucky People (1998), p. 588. Today some 150 events are taking place in the U.S. and internationally to commemorate the 100th anniversary of the birth of Milton Friedman (1912–2006). I will be hosting a Houston event this evening with presentations by myself and University of Houston economist Thomas Mayor on Friedman’s many contributions that, in sum, opened the door for libertarian thought in academia and within the wider public. Milton Friedman (July 31, 1912 – November 16, 2006) was an American economist, statistician, and author who taught at the University of Chicago for more than three decades. He was a recipient of the Nobel Memorial Prize in Economic Sciences, and is known for his research on consumption analysis, monetary history and theory, and the complexity of stabilization policy. Many other biographies can be accessed on Friedman; this post will continue with some Friedman quotations of import on various topics except for those to come in Part II (energy) and Part III (political and special-interest capitalism). “I start from a belief in individual freedom and that derives fundamentally from a belief in the limitations of our knowledge [and] from a belief—that nobody can be sure that what he believes is really right. So the most attractive position—is putting individual freedom first. I was impacted in 1980 by the film series “Free to Choose” and I was very impressed by the performance by Thomas Sowell. Today he remembers his former teacher Milton Friedman. 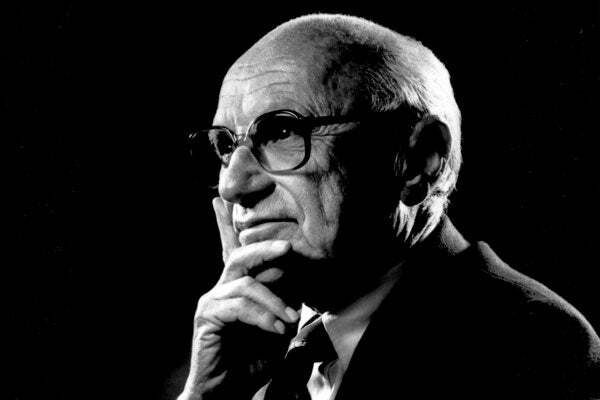 If Milton Friedman were alive today — and there was never a time when he was more needed — he would be 100 years old. He was born on July 31, 1912. But professor Friedman’s death at age 94 deprived the nation of one of those rare thinkers who had both genius and common sense. Most people would not be able to understand the complex economic analysis that won him a Nobel Prize, but people with no knowledge of economics had no trouble understanding his books such as Free to Choose or the TV series of the same name. In being able to express himself at the highest level of his profession but also at a level that the average person could readily understand, Milton Friedman was like the economist whose theories and persona were most different from his own — John Maynard Keynes. As a professor, he did not attempt to convert students to his political views. I made no secret of the fact that I was a Marxist when I was a student in professor Friedman’s course, but he made no effort to change my views. He once said that anybody who was easily converted was not worth converting. I was still a Marxist after taking professor Friedman’s class. Working as an economist in the government converted me. What Milton Friedman is best known for as an economist was his opposition to Keynesian economics, which had largely swept the economics profession on both sides of the Atlantic, with the notable exception of the University of Chicago, where Friedman was trained as a student and later taught. In the heyday of Keynesian economics, many economists believed that inflationary government policies could reduce unemployment, and early empirical data seemed to support that view. The inference was that the government could make careful trade-offs between inflation and unemployment, and thus “fine-tune” the economy. When both unemployment and inflation rose at the same time in the 1970s — “stagflation,” as it was called — the idea of the government “fine-tuning” the economy faded away. There still are some die-hard Keynesians today who keep insisting that the government’s stimulus spending would have worked, if only it was bigger and lasted longer. Although Milton Friedman became a conservative icon, he considered himself a liberal in the original sense of the word — someone who believes in the liberty of the individual, free of government intrusions. Far from trying to conserve things as they are, he wrote a book titled Tyranny of the Status Quo. Milton Friedman proposed radical changes in policies and institutions ranging from the public schools to the Federal Reserve. It is liberals who want to conserve and expand the welfare state. As a student of Friedman back in 1960, I was struck by two things — his tough grading standards and the fact that he had a black secretary. This was years before affirmative action. People on the left exhibit blacks as mascots. But I never heard Milton Friedman say that he had a black secretary, though she was with him for decades. Both his grading standards and his refusal to try to be politically correct increased my respect for him. Thomas Sowell is a senior fellow at Stanford University’s Hoover Institution. Today it is 100 years from the birth of Milton Friedmon (July 31, 1912). Below are all the links to posts today celebrating his life. There are lots of videos, transcripts and articles about his life. Enjoy!!! In the video above Milton Friedman takes on some liberal students with their challenges to capitalism. I went to the Capitol several years ago and just walked around Congress and sat in and listened to the speeches. When I was leaving I walked near an elevator and when it opened I noticed that Donald Rumfeld got off and then all these flashes went off and I realized that all these cameras were filming him. I got to my hotel that night and I saw my ear on national tv news that night. All three networks too. Too bad my 15 minutes of fame might just be reduced to 2 seconds and to my ear only. Mr. President (George W. Bush), Rose and Milton (Friedman), Minister of Defense of Italy (Antonio) Martino, a student of Milton’s, colleagues and friends, it’s good to see you all. I am delighted to join in celebrating the life and work of a good friend, and a rare talent-indeed, a talent to be treasured. Last year, I was disappointed to miss the birthday lunch that Ed Feulner hosts every year at some fish house on the road to Bohemian Grove in July. It’s nice of the President to bring us all together for an early celebration here in the EEOB (Eisenhower Executive Office Building). And Milton, what an impact you have had. Precious few people live long enough to witness the rise and fall of empires. Even fewer can see that their work has had a profound effect on those truly momentous events. Milton is the embodiment of the truth that “ideas have consequences.” Over the course of his career, he has turned down offers of influential posts, in and out of government, preferring to fight the battle of ideas, trusting that reasoned argument could change the course of history. And indeed, as we heard from Gary Becker, Ed Meese and Alan Greenspan, it has changed the course of history. Of course, we cannot honor Milton without also honoring Rose. I’m told they met in Economics 301 at the University of Chicago… how appropriate. Rose, as has been indicated, has been the intellectual collaborator ever since, to his and our great benefit. They were creators of the television series, “Free to Choose.” Several decades ago I had the good fortune to participate on occasion on their television shows. There is something about Milton that when I am around him, and talking to him, I feel smarter. (laughter)… So I felt very fortunate to do that. More recently, their book, a joint-memoir, “Two Lucky People,” as Alan has indicated – really should be reversed, because we indeed are the lucky ones and have benefited from that lifetime of collaboration. I’m told that when Capitalism and Freedom came out in 1963, it was almost ignored by the mainstream press. The ideas were seen as so unorthodox – so unusual – that no major newspaper bothered to do a book review. As a young Congressman in the 1960s, I used to go to seminars at the University of Chicago. Bob Goldman was the Director of the Center for Continuing Education there, He would gather a cluster of geniuses, and then allow a few young pups to come in and learn at their feet. As a then young pup, I was so privileged, and participated on a number of occasions. I remember well the conference on the “all-volunteer” Army-Milton was persuasive that I became an early advocate- as a young congressman, introducing legislation, testifying before the House and Senate Armed Services Committees, and then, as a young Cabinet officer in the Nixon Administration working to help achieve the all-volunteer service. Later, life turned down, and George Shultz came to me and asked me if I would run the wage price controls for the United States of America. (laughter) It was the country’s first peacetime experiment. As I recall, it was not Milton Friedman, but H. L. Mencken who once said, “For every human problem there is a solution that is simple, neat and wrong.” Richard Nixon found it. Early on, I figured out that the key to success was not to even try to manage wages and prices. Senator Proxmire’s law, I think written on the back of an envelope, was only a paragraph or two, and it embarrassed the President because inflation was coming along and the President wasn’t stopping it. So he passed a law saying that the president shall have the right to control wages and prices. I put the law on the floor in my office, next to my desk. And then every time The Wage Board, or The Price Commission, or The Health Services Board, or The Rent Board, or The Construction Stabilization Industries Board, any one of those alphabet boards that were spawned by this Economic Stabilization Act – every time they issued a regulation, we stuck on top. Before too long it started working its way up to the ceiling. As a reminder for everybody for the potential damage we were doing. He’s not here and I hate to talk behind people’s back, but I think the record should show that Vice President (Richard) Cheney, of course, was part of that operation, (laughter) and I have never once seen it on his resume. (laughter) But he was there. There was one other thing we did early on was to get agreement that any employee of the wage price controls could be fired within 30 days. The goal was to not allow a permanent bureaucracy to self-perpetuate, and it worked. So we worked and we worked we kept letting out everybody, we kept freeing up all of these categories. We had tiers and we would let this group free at wages and controls, and this group free at price controls, because it was an option or because of something else, or because it was food and the answer to (inaudible) prices is high prices. And after a while, Milton Friedman called me up and he said, “You have got to stop doing what you are doing.” And I said, “Why? Inflation used to be up at around 6 or 7, it’s now down to about 4 or 5. We’re freeing up all kinds of activities. We’re not doing much damage the economy.” He said, “I know, I know that. But you’re not the reason inflation is coming down, and YOU know that! (laughter) I said “That’s true.” And he said the problem is that people are going to think that you’re doing it, and you’re not – you’re letting everybody out and Inflation’s coming down and they’re going to learn the going to learn the wrong lesson. And it’s important he did not quite go as far as to say that I should start damaging the economy, but that was right underneath what he was telling me. (laughter) And of course he was correct. Of course, the central theme of Milton’s work in public policy has been the defense and promotion of human freedom-and the critical link between political and economic freedom. You know, what’s remarkable about this man is that he was making these arguments in the heyday of the Great Society-a time when the Federal government was growing in unprecedented size and scope. Against the rising concentration of federal power, he stood as an often lonesome voice. “If government is to exercise power,” he declared, “better in the county than in the state, better in the state than in Washington, D.C. because if I do not like what my local community does, I can move to another community… and if I do not like what my state does, I can move to another. But if I do not like what Washington D.C. imposes, I have few alternatives in this world of jealous nations.” I’ve heard President Bush express similar sentiments. Building a truly great society requires not the power of government, but unleashing the power of human freedom — creating a climate in which millions of individuals can think, speak, create and build. People behind the Iron Curtain were listening — the dissidents and intellectuals of the captive nations, who were later to become the Presidents and Prime Ministers of free nations. So, yes, he has changed the course of history. Every Friday you need to click on www.theDailyHatch.org if you would like to see a video clip of Milton Friedman as he shares his common sense conservative economic views. Many of his articles are posted too. I remember growing up and reading those great articles every week in Newsweek. They are just as relevant today as they were then. So many points brought up by liberals sound so good at first but really are easy to answer logically. Take the example below. Phil Donahue: When you see around the globe, the mal-distribution of wealth, a desperate plight of millions of people in underdeveloped countries. When you see so few “haves” and so many “have-nots.” When you see the greed and the concentration of power. Did you ever have a moment of doubt about capitalism and whether greed is a good idea to run on? Milton Friedman: Well first of all tell me is there some society you know that doesn’t run on Greed? You think Russia doesn’t run on greed? You think China doesn’t run on greed? What is greed? Of course none of us are greedy, it’s only the other fellow who is greedy. The world runs on individuals pursuing their separate interests. The great achievements of civilization have not come from government bureaus. Einstein didn’t construct his theory under order from a bureaucrat. Henry Ford didn’t revolutionize the automobile industry that way. In the only cases in which the masses have escaped from the kind of grinding poverty you’re talking about – the only cases in recorded history – are where they have had capitalism and largely free trade. If you want to know where the masses are worst off, it’s exactly in the kinds of societies that depart from that. So that the record of history is absolutely crystal clear that there is no alternative way so far discovered of improving the lot of the ordinary people that can hold a candle to the productive activities that are unleashed by a free enterprise system. Friedman: And what does reward virtue? You think the Communist commissar rewarded virtue? You think a Hitler rewarded virtue? You think – excuse me – if you’ll pardon me – do you think American Presidents reward virtue ? Do they choose their appointees on the basis of the virtue of the people appointed or on the basis of their political clout ? Is it really true that political self-interest is nobler somehow than economic self-interest ? You know, I think you’re taking a lot of things for granted. Just tell me where in the world you find these angels who are going to organize society for us ? Well, I don’t even trust you to do that. Arkansas was going to play Tennessee in 2012 but that got taken off the schedule. Tennessee has to play a Missouri team that in my view is unpredicable. Alabama and LSU play tough schedules every year. Tennessee usually plays a top 10 like Oregon to start off the year but they play NC State instead this year. Face Ole Miss and Auburn in crossover and play only three true road games in weaker East. Face Ole Miss and Auburn in crossover with Florida, South Carolina and Tennessee at home. LSU and Bama are losses anyway and both on the road, but five of other six are winnable games. Plays managable road slate; gets Bama and LSU at home and Kentucky in crossover. Four of first five are at home with winnable road trips to Tennessee and Texas A&M. No LSU or Arkansas in crossover helps with Florida and Mizzou at home. Brutal road slate – at LSU, Arkansas and Missouri — with a much easier home schedule. At Hogs and Mississippi State at home in crossover. Trips to Mizzou, Florida and Tennessee. Toughest games at home and trip to Bama. Winnable road games at Ole Miss, Vandy and Mississippi State. LSU (road) and Arkansas (home) in crossover, with trips to Florida and Vandy in division. Florida (road) and South Carolina (home) is a tough crossover. Visits A&M, Auburn and Arkansas as well. Hmmm: At Bama, at Arkansas, at Georgia, at LSU? Will play five of the top seven teams in the league — and Auburn, Mississippi State. On my blog www.thedailyhatch.org I have an extensive list of posts that have both videos and transcripts of MiltonFriedman’s interviews and speeches. Here below is just small list of those and more can be accessed by clicking on “Milton Friedman” on the side of this page or searching for Milton Friedman also. Photo by Associated Press /Chattanooga Times Free Press. One hundred years ago today, the most powerful defender of economic liberty in American history was born in Brooklyn to poor Jewish immigrants. Though he stood barely five feet tall, Dr. Milton Friedman was a giant in the field of economics and the most important friend of freedom America has seen in the past century — perhaps even since the Founding Fathers. A 1976 Nobel-prize winner for his research on monetary policy, he is best remembered for eloquently dismantling economic falsehoods. Because of Friedman, most Americans know that government can’t spend its way out of economic trouble or create economic prosperity. Well, most Americans except our current president, anyway. At a time when half of the world’s people were economically enslaved by communism, Friedman’s writings laid the groundwork for the small government ideas of Barry Goldwater and, later, the Reagan Revolution. Friedman’s book “Capitalism and Freedom” is to free market principles what “The Communist Manifesto” is to communism. The biggest difference is that Marx and Engels’ ideas are responsible for the deaths of more than 100 million people, while the free market philosophies championed by Friedman and others have resulted in worldwide improvements in quality and quantity of life. With local, state and federal governments all dipping deeper into taxpayers’ pockets and spending more money on less justifiable programs, it is a particularly worthwhile time to reflect on one of Dr. Friedman’s most legendary statements. “There are four ways in which you can spend money,” Friedman said. “You can spend your own money on yourself. When you do that, why then, you really watch out what you’re doing, and you try to get the most for your money. Let’s hope a few bureaucrats and elected officials read those words and show a little more concern for the people who furnish all of those dollars. Though Friedman died in 2006, his birthday should be celebrated by every person who believes that people — not government — are the reason why we live in the richest, healthiest, safest, most prosperous time in the history of the world. America’s public education system is failing. We’re spending more money on education but not getting better results for our children. For decades, teachers’ unions have been among our nation’s largest political donors. As Reason Foundation’s Lisa Snell has noted, the National Education Association (NEA) alone spent $40 million on the 2010 election cycle (source: http://reason.org/news/printer/big-education-and-big-labor-electio). As the country’s largest teachers union, the NEA is only one cog in the infernal machine that robs parents of their tax dollars and students of their futures. “The Machine” is 4:17 minutes. Written and narrated by Evan Coyne Maloney. Produced by the Moving Picture Institute in partnership with Reason TV. Visit http://www.MovingPictureInstitute.org to learn more. No one did more to advance the cause of school vouchers than Milton and Rose Friedman. Friedman made it clear in his film series “Free to Choose” how sad he was that young people who live in the inner cities did not have good education opportunities available to them. Let us imagine we have the power to rebuild our education system from the ground up—an appropriate mental exercise as we remember the late Nobel Prize–winning economist Milton Friedman on his 100th birthday tomorrow. If we could rebuild our education system from scratch, it’s unlikely we would create a system that assigns children to government-run schools based on their parents’ zip codes. After all, geography and income shouldn’t determine a child’s educational opportunity. If we rebuilt our education system to reflect Friedman’s philosophy, parents would be free to choose an education that best met their children’s needs, with money following the children to any schools of their choice: public, private, charter, virtual, or home school. Arizona enacted groundbreaking education savings accounts, Indiana created the largest voucher program in the country, and the highly success D.C. Opportunity Scholarship Program was reauthorized. While school choice momentum has been building dramatically in the last two years, most children still attend assigned public schools. For too many families, school choice remains out of reach. Poor families are most affected by this lack of choice. As Friedman noted, “There is no respect in which inhabitants of a low-income neighborhood are so disadvantaged as in the kind of schooling they can get for their children.” It is a sad statement quantified by data on low levels of academic achievement and attainment. In Denver, just 44 percent of students graduate. In Philadelphia, a mere 46 percent of students complete high school. And in Detroit, just 33 percent of children graduate. And if they are persistent enough to graduate, what have they learned? Nine percent of Baltimore fourth-graders are proficient in reading. Just 11 percent of their eighth-grade peers can read proficiently. A devastating 7 percent of Cleveland fourth-graders are proficient in reading. In Detroit, just 6 percent can read proficiently. These low levels of academic achievement and attainment aren’t confined to low-income students or urban school districts. Across the country, for all children, just one-third can read proficiently. Graduation rates have hovered around 74 percent since the 1970s, and math and reading achievement has been virtually flat over the same time period. On international assessments, American students rank in the middle of the pack, outperformed in math by the Czech Republic, Slovakia, and Estonia. That’s certainly going big on school choice. But what exactly did Friedman mean by “privatizing a major segment of the educational system”? Just because we have agreed to the public financing of education does not mean government should be the sole provider of that education and dictate where children go to school. As we remember Friedman on his 100th birthday, we need to rethink what “public” education means, thinking instead in terms of educating the public, not in terms of government-run schools—that is, as publicly financed but operated by many different providers. If we consider public education in those terms, we can start to think through funding mechanisms at the state level that will bring about widespread school choice. Today, we have a growing number of innovative school choice options—charters, vouchers, tax credits, online learning, and education savings accounts, to name a few. These options were conceived in the mind of Friedman and are being brought to life by reform-oriented governors and legislators across the country. While these reforms have been a long time in the making, Friedman would no doubt be proud of the progress that has been made on school choice over the past few years. And thanks to his formational work, children across the country are increasingly gaining access to customized education that meets their unique needs.